Whitehall Media, the UK’s market-leading business-to-business multi-platform media group is hosting their Big Data Analytics Conference in London tomorrow. David Akeroyd, Head of Operations Support System Architecture at Telefonica UK will be presenting the many challenges facing Communications Service Providers, especially those as customer centric as Telefónica UK (which uses O2 as its commercial brand). David will be joined by our own Director of Industry Solutions, Adrian Pasciuta, 12:15 BST and again at 2PM. The presentations will discuss how O2 is using an Operational Intelligence platform to gain real-time insight into customer issues and proactively respond to and convert those issues into opportunities. Their challenges include understanding issues that are having an effect on the customer, and maximizing customer engagement by reacting to an individual’s unique situation. Vitria is delighted to be on stage with O2 to talk about how Big Data is changing the way they approach mobile customer management. Big Data Analytics is an event geared towards senior business leaders or large corporations who wish to leverage the opportunities that big data can bring to their business and technology leaders who approve or recommend analytical systems and solutions that run against large data sets, and are planning an analytical project in the next 12 months. 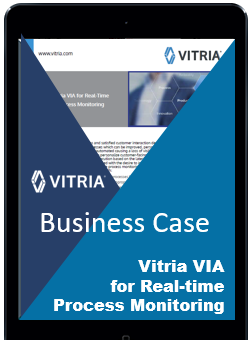 We’re honored that O2 has chosen to stand in public alongside us, and humbled that Vitria Operational Intelligence is proving to be the business insight tool that they needed.